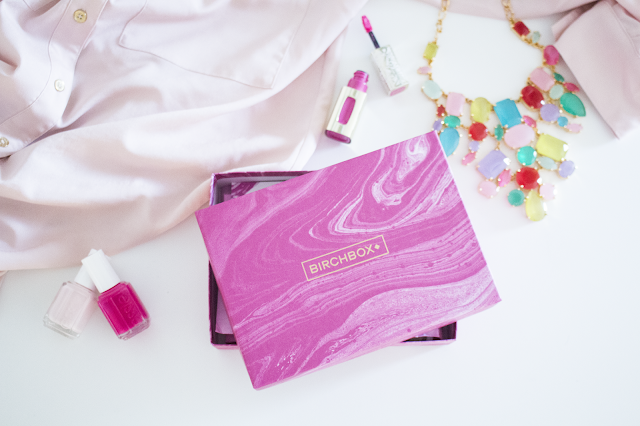 This month's Birchbox came in the mail the other day, and I must say, I was definitely not disappointed. 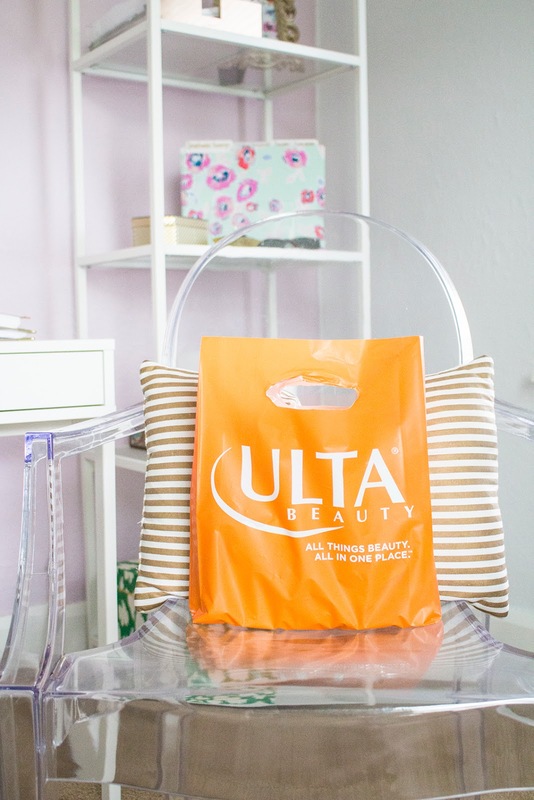 Skin care products, hair care, and a travel size lotion all made the cut this month. I love trying new things, and getting this box in the mail definitely allows me to do so! Let's dive in and see what I got! 1 // BioRepublic Pomegranate Crush Illuminating Sheet Mask. First, this mask smells heavenly. Second, it's amazing! I love a good face mask, especially one that is illuminating because my skin tells to look dull and lifeless quite frequently. Infused with botanical extracts, this fiber mask brightens skins and evens tone. 2 // Jane Iredale HandDrink Hand Cream. Around this time of year my skin gets really dry. the complete opposite of how oily it gets during the summer. With that said, I am always stocking up on lotions to throw in my purse, at my desk, in my car, and by my bedside. This lotion is very light and my hands are not left feeling greasy (what a relief!). It also happens apple extract in it which helps brighten skin. 3 // R+Co DEATH VALLEY Dry Shampoo. 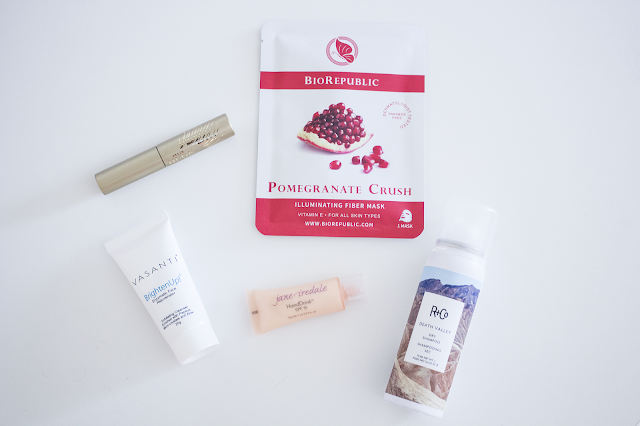 Last Birchbox, I received a similar type of product that I wasn't too fond of, but this one I love. It not only smells great and is a dry shampoo but it adds a lot of volume and life to my hair (something that is needed). A great dry shampoo to throw in your purse or travel bag for a midday hair pick-me-up. 4 // stila huge extreme lash mascara. I have been on the search for a good mascara for a few years now. As this is one of my favorites, I get bored with it…the stila mascara adds volume, length, and the right amount of jet back. A definite good change from what I was using. 5 // (My Favorite!) Vasanti Cosmetics BrightenUp! Enzymatic Face Rejuvenator. This is by far my favorite. I love enzymatic face washes (like this one), and this face wash is at the top of my list. It has micro-crystals that mimic microdermabrasion and wipe away surface debris and it's infused with aloe to cleanse the skin. For years I have tried just about every skin product, not one has left my skin as soft and glowing like this one! One more thing, can we talk about this box!? I have a deep affinity for anything that's square, has a lid, and stores objects. This box, along with last months looks great on my shelves. A pop of color here and there is a good thing, right? !